And dang it I keep meaning to visit the rabidlittlehippy and get side tracked constantly! Visit Jessie, she’s a smart young mum. 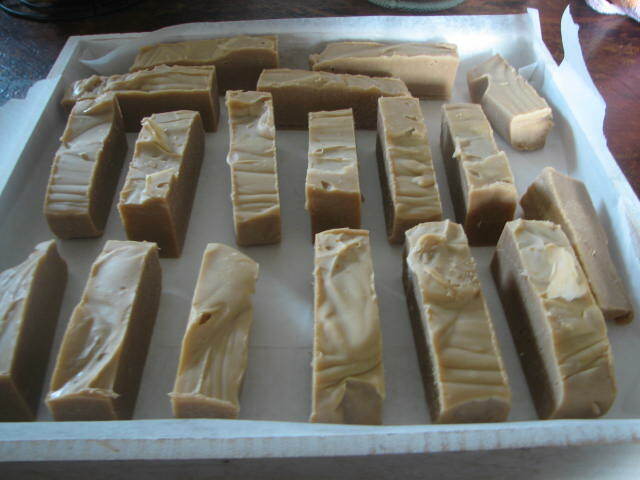 When I saw the photo come up in the reader, my first thought was ‘Wendy’s been making fudge.” So I am glad that you also think your soap looks like fudge.But fudge is good, so the soap will be, too, I am sure, even if it isn’t exactly how you intended it to be. I used to be a big fudge-maker many years ago…still get an occasional phone call from my son asking me to make a batch and post it to him 🙂 I eat one piece then package it quickly…this so made me want to make some just for me lol. Even in efforts to eat healthy there are occasional things that tempt..even soap! Perhaps to put your taste buds off fudge, you could nibble some of the fudge-like soap. That might stop fudge thoughts in their tracks. 🙂 yes they do, I had to read it to find out it was soap..lol..if I saw it alone on the counter I may of eaten some-lol!!! I keep having “new enthusiasms” too Fran and honestly….make the soap. It’s affordable, beautiful and a real treat. i have become so obsessed with soap I am actually spending money!! And researching plenty….Pinterest Fran!! I have so many ideas I have started a book to write them all in. LOVE IT! I wish I had tried making it years ago, I have missed out on such alot of fun!!! I am hoping I can sell some because if I can’t we are going to have issues here lol. I would like to make paper too and flower ink I reblogged over a year ago…too many ideas! !